12:30 pm: We arrive in Pisac and drop our bags at a beautiful hotel one block off the main square. 1 pm: After a quick spin through the square to get our bearings, we stop at one of the many huge empanada ovens for a quick and cheap (S/2.50) bite. Absolutely delicious. Not to be missed. 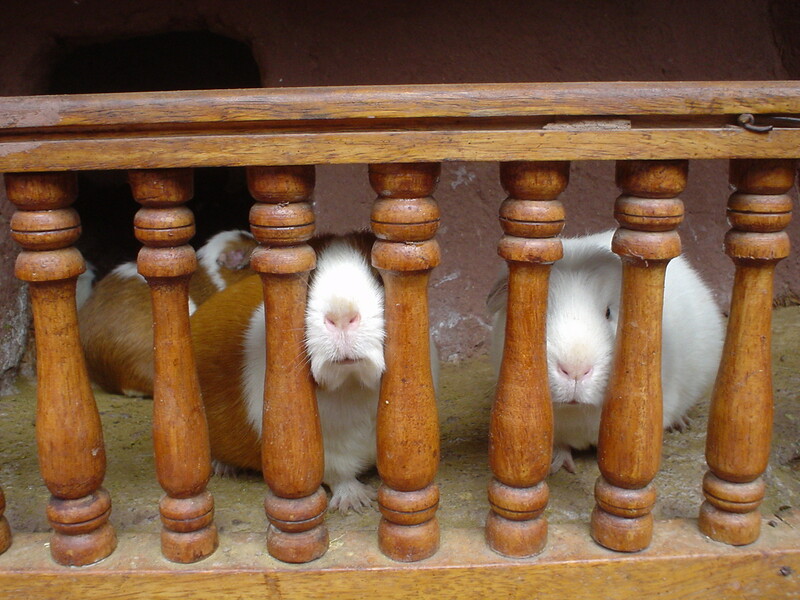 However, if you are considering sampling the famous Peruvian cuy, try to avoid looking at the extraordinarily cute guinea pig habitats they have at all the empanada stalls in Pisac. You might lose your nerve. 1:15 pm: Even though I haven’t played in 20 years, I am quickly convinced that I need a Spaniards vs Incas chess set for a mere 20 soles. I can figure out how to play again later. 2 pm: A beautiful young local convinces me to buy an amazing stone necklace and matching earrings for my girlfriend. Even though I don’t have one. If all else fails, I have a nice Christmas gift for Mom. 4:15 pm: Negotiations begin between my Korean travel companion and an older indigenous seller over a beautiful hand-woven rug. Both stake out firm positions. Both are certain of victory. This could take a while. She has warned me that Koreans are the toughest negotiators in the world, but the odds seem to be stacked in favor of the natives. I will sit back and observe. 4:15 pm: I begin negotiations with a local dog about the last bite of my third empanada of the day. I cannot bear the thought of giving it up, but he is quite persuasive. This could also take a while. 4:30 pm: The markets are beginning to close up and the selling gets more aggressive. Instead of buying the exactly zero wall tapestries that I need, I purchase two for 60 soles. I guess I can staple them to the outside of my backpack. 4:35 pm: After walking away twice and then returning (an excellent strategy, in my opinion), negotiations continue between my Korean travel companion and her fierce competition. The seller has brought in two family members for support and they have her surrounded. I choose to stay well clear. 4:40 pm: I walk by another empanada stall and briefly consider a fourth (my canine companion wags his tail in support), but think better of it when I see fresh churros just down the block. Hot churros filled with dulce de leche are also a must-try in Peru. 4:50 pm: The Korean finally approaches with a bag. There are two rugs instead of one. I try not to make a value judgment on who won and who lost in that exchange. 5:05 pm: Even though I have absolutely no need for one, the sun setting on the stuffed llamas convinces me otherwise and I pay full price without a second thought. I am quickly scolded by my Korean travel companion for breaking the rules of the game. 7:15 pm: After an amazing dinner on the main plaza, we return to our hotel. The hotel owner lets us start a fire in the living room and we sit with him and watch Latin dramas on TV until the three of us have emptied a bottle of wine. Time to sleep and rest up for a day of exploring the Pisac ruins! The Inca ruins ruins at Pisac are also an incredible experience and something you should give yourself ample time to explore; we spent 4 hours there and could have easily spent 4 more. There are guides who will happily walk the entire site with you and explain the historical and archeological context for just a few soles. There are also excellent group tours that can be arranged through our friends at Southern Crossings. Casey Swendig is a freelance travel writer, chef, and aspiring novelist from Portland, Oregon who is currently living and working in Cusco. This entry was posted on Wednesday, September 29th, 2010 at 5:24 pm	and is filed under Peru. You can follow any responses to this entry through the RSS 2.0 feed. Jin Lee? Is your travel buddy? I hope you had fun.